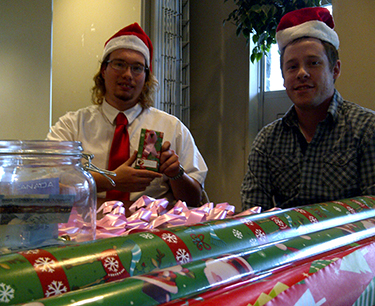 A student at Dalhousie University is wrapping Christmas presents this Holiday season to pay for his master’s thesis. Timothy Gravelle, a second-year graduate student in the kinesiology program, set up shop in the Student Union Building Tuesday to wrap gifts in return for donations. He says he’ll use this money to help fund his research, which involves prescribing exercise routines for survivors of breast and gynecological cancer. Gravelle says he hopes to attract at least four volunteers to participate in the first part of the study, which will take place in Dal’s Dickson Building. He says the building’s parking fees, even at $10, could potentially detract participants from signing up. At 2 p.m., Gravelle had counted $40 from his donations jar. Although Gravelle studied personality traits for his undergraduate thesis project, he says he found a niche within the greater context of cancer research and decided to run with it. Gravelle notes because he’s a certified exercise physiologist he can work hands-on with participants. He says the QEII Health Sciences Centre’s Dickson Building houses all the appropriate resources – such as staff and equipment – to facilitate his work. Gravelle’s professor, Melanie Keats, agrees her student is on to something. Keats says the research could uncover specific resistance exercises that benefit breast and gynecological cancer survivors and patients. Yet, she admits she’s never had a student wrap gifts to help fund their work. Gravelle says he applied for grants from the Canadian Institutes of Health Research and other organizations – but to no avail. Gravelle’s friend, Josh Goreham, another kinesiology grad student, says he too applied for funding but didn’t receive it. The 2012 Canadian Cancer statistics, tabled by the Canadian Cancer Society and Statistics Canada, reported 740 new cases of breast cancer in Nova Scotia along with 160 deaths. The report highlights a decrease in the rate of mortality since 1998. The figures for breast cancer are more or less consistent across the country. As per specific exercises for survivors, Deanna Jones of the Canadian Breast Cancer Foundation says her office has helped fund dragon boat races and exercise programs for cancer patients, but she’s not sure how specific the exercises are. Gravelle says he’ll most likely be back out in the SUB wrapping gifts before Christmas, or if he can get permission, at Walmart. Anyone who makes a donation receives the standard pink cancer ribbon.